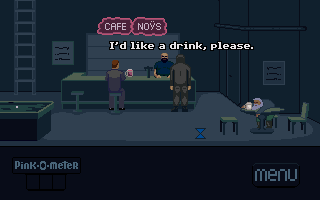 Don't Drink the Pink is a short point-and-click game made for the January 2014 MAGS competition "Something Cold, Something Burrowed, Something Pink. So, if you're up for a little adventure and imagine yourself enjoying a simple story about a man, few pints of pink and occasional elephants, just click on the download link. "Nice graphics and music complement 15 amusing minutes of surrealism." God graphics style and fun to play. Enjoyed the graphics and the style altogether. A very well put together game. Definitely worth playing for the game play and the humor. A funny game with logical puzzles and some nice art! I definitely recommend this clever 15 minute experience. I think this was a fun and funny game and I enjoyed playing it.